The Legoland Fairy. Not sure why she's got a ripped dress but et la! We decided to descend on Legoland yesterday - forgetting lots of key things about the place like the fact that you really need to arrive within a smidge of it opening to avoid the traffic, the queues to get in, and the queues for the rides (basically if you ever want to go - and go on everything - don't go at weekends or at half term!). The single most annoying moment of the day for us was queueing up for over an hour for a ride which subsequently broke down just as we were getting to the end of the queue. The second single most annoying moment of the day was hearing a mother shouting at her son (something she was obviously well practiced in). 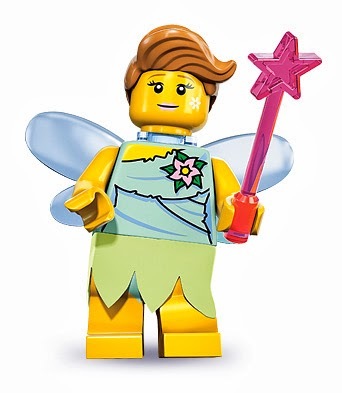 Her exact words..
"Will you stop (bleeping) prancing around like a (bleeping) fairy!" I have a couple of issues with this statement. One: the inference that little boys should not show any signs of glee or enjoyment (certainly not by prancing around and jumping up and down with excitement) and two: the use of the word "fairy" - in this instance used in a semi-homophobic way by a mum who probably has quite a few 'fruity' views on subjects you really wouldn't trust her views or judgement on. It stuck with me for the rest of the day, distracting me from the fact that - as a very expensive leisure destination - Legoland is a bit poo really, and for the entry cost, the cost of some of the "extras" and if you're crazy enough to eat there (you really would have to be insane not to take your own lunch - and Legoland know this, which is why it's nigh on impossible to find anywhere to enjoy a picnic that isn't a gigantic sodding wasp magnet) you could probably buy some seriously expensive sets and sit at home having a fabulous day building them. It even distracted me from those people who barge to the front of the queue, offering up a weak "excuse me, can I squeeze past" without finishing the sentence with "I haven't got a Q-Bot pass or anything but at the end of the day, to be honest, I will punch you repeatedly until you lose consciousness if you try to stop me jumping the queue? D'ynarwhatimean? By the way I have an IQ that's less than your shoe size and I can't get it up any more so this is my compensatory default behaviour." My wife has visited Legolands elsewhere and said how amazing they were, and how different. We get the scabby offspring here in the UK, quelle surprise - but for all its faults and for all the petty little annoyances yesterday, that one incident with the mother and her boy p*ssed me off more than anything else - even the queue-jumpers and wasps.